I graduated from Pharmacy school then went on to medical school.I have been a Primary Care Physician for the past 37 years. We have 8 wonderful grandchildren ages ranging from 2 years old to 9 years old. 5 girls and 3 boys. They are now our greatest joy in life. 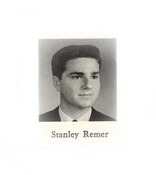 Stanley Remer has a birthday today.